I love Casablanca with everything I’ve got. It somehow manages to juggle being hilarious, sad, and sweet with perfect balance. 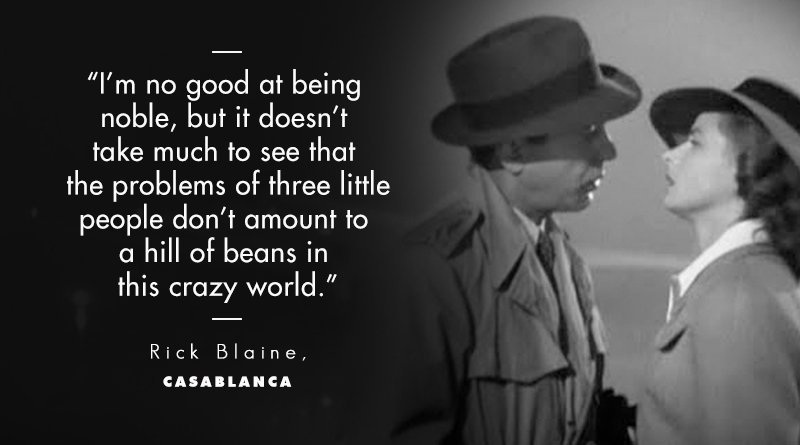 It is one of my all time favorite movies, and every time I watch Casablanca, I get something new out of it, whether it be great comedic moments or newfound appreciation of the snappy dialog. On my most recent viewing, I noticed something outstanding regarding the character of Rick Blaine. At this point, anyone who hasn’t seen Casablanca yet has seen it parodied in several works before. All you need to know is that Rick is an American running a saloon in Casablanca, Morocco during World War II. He is a loner and keeps to himself until Ilsa walks into his life for the first time since abandoning him in Paris one year prior. Rick is capable of helping Ilsa and her husband Victor Laszlo escape via letters of transit. Victor is a Czech resistance leader wanted by the Nazis after escaping a concentration camp, so it is imperative that he and Ilsa escape to America. Rick is hesitant to help them because he feels spurned by Ilsa and robbed of his chance at love and happiness. By the end, he decides to abandon this attitude and do the right thing by helping them escape. An important thing to keep in mind when discussing Casablanca is that it was made during the war. One of the most heart wrenching scenes of the whole movie is when the German officers have the band at Rick’s cafe play their national anthem and Victor gets everyone else to drown them out by belting the French national anthem right back at them. What makes this scene so powerful is that most of those actors were refugees fleeing the Nazis. This was something that they were experiencing presently and had no clue what the state of the world would be when it was all over. At the time that the film takes place, America hadn’t even entered the war, and that’s exactly what the movie is about. Rick is an American in a position where he can help the scores of people who come in and out of his bar daily and have been left destroyed by the war, but he chooses not to. He is willing to justify allowing suffering to continue happening to avoid messing up his own status quo. The corrupt Captain Renault explicitly states that while many illegal exit visas are sold in Rick’s cafe, he allows the bar to stay open because Rick himself has never sold one, along with the fact that Rick allows Renault to win at roulette. Throughout the movie we see Rick look the other way toward injustices in order to look out for his own self-interests much in the same way that America stayed out of the war. All he wants to do is stay neutral and avoid politics despite running a saloon in the middle of a highly politicized geographic location. The fact of the matter is that there is no such thing as neutrality in politics. A more accurate label to apply to such behavior would be to call it willful ignorance. Rick looks the other way because it is more convenient to look the other way. Similarly, despite the horrors of World War II, America stayed neutral for two years into the war and only decided to intervene when it was directly affected by the attack on Pearl Harbor. In partaking in this behavior, Rick becomes complicit in these horrific acts. If you’re being mugged and I have the ability to help you but choose not to, I’m partly to blame for whatever ill fate may befall you. Rick finally decides to help Ilsa and Victor when he realizes that the history he has with Ilsa is nowhere near as large as the impact that Victor’s freedom would have on the war effort. What sets this ending apart from the parallels of the real life events is that Rick chooses to help out of his own free will. There is no metaphor for Pearl Harbor that makes him decide to help. Rick instead helps due to his own compassion, which I find much more compelling. Ilsa and Rick fell in love when they were in Paris and she told him that her husband was dead. He later learns Ilsa abandoned Rick in Paris because she left him for Victor Laszlo, leading him to his pessimistic outlook on life and consequently, the war. A third revelation shows us that it was Victor who Ilsa was married to previously. He was reported dead but shortly before Rick and Ilsa were to leave Paris together, she learned that he was still alive. This gives Rick a new outlook as he realizes that while he was hurt at the end of it all, the circumstances are much larger than him, which is what gives him the strength to put his feelings aside and finally stick his neck out for somebody. This appeal to humanity is something that I think we can all learn from. What sets it apart from the real world parallels is that no part of Rick’s motivation comes from his nationality. Rick is American, Laszlo is Czech, and Ilsa is Norwegian, but none of that matters. They don’t align their wartime ambitions on ‘This is my country and it is good because it is mine!’ but instead from a viewpoint of ‘This is the right thing to do, regardless of one’s lineage.’ Their humanity transcends borders and bloodlines. As a child, I heard the phrase ‘bleeding heart liberal’ thrown around as a disparaging insult. Being too young to understand the implications of that combination of words, I took it to mean ‘a bad person,’ but now I see that it simply describes someone who isn’t afraid of embracing their own empathy. In my experience, certain people tend to view empathy as a weakness, while others view it as strength. While there are very good arguments to be made on both sides, I personally think that the pros of empathy outweigh the cons. I consider Rick to be one of my favorite cinematic heroes for his empathy in particular. There isn’t a bomb about to go off and he has to act quickly, and he isn’t armed to the teeth ready to avenge a dead wife. What sets Rick apart from most other heroes is that he has no reason to act, but still chooses to. He could sit out for the events of the movie, and come out on top, but his humanity outweighs his desire to avoid problems. He saves the day not because of his political alignment, but in spite of them. We need more heroes like him to stick their neck out and act for those who are unable. Until then, we’ll always have Casablanca. Here’s looking at you, Rick. Older PostBoJack Horseman - Can We Forgive?